Sandpainting is an ancient and sacred Tibetan art form intended to uplift and benefit those who see it as well as bless the environment. The idea of the Wheel of Life is 2500 years old and was a gift from Buddha. 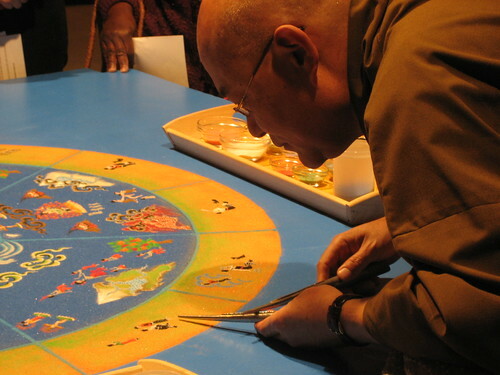 The artist creating this particular Mandala, Losang Samten, was the first to create them in the United States and the first to create them in sand. While no two Mandalas are the same, they are identical in concept: the same symbols, characters and designs are used. A few of the highlights: the center of the Wheel of Life holds the 3 poisons — the snake (anger), the rooster (greed) and the boar (ignorance) on a blue background symbolizing the nature of the human mind. Surrounding that is a dark and light area — the yin and yang. On the light side are representations of those who seek lessen the effects of the poison; on the dark side are those who suffer due the poisons. 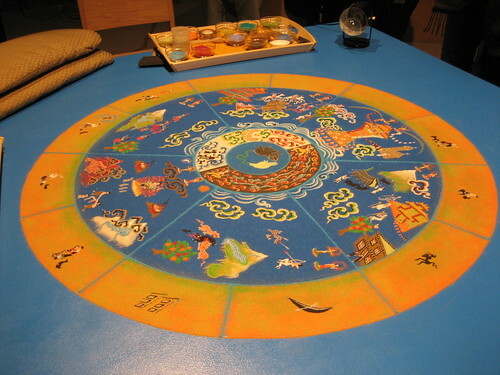 The next circle is comprised of six main sections — human existence, animal kingdom, karmic hell, hungry ghosts, realm of the demi-gods, heavenly realm — that illustrate life situations and their conditions which result from these poisons. The outer ring of the Mandala has twelve illustrations representing the twelve phases of human conciousness. You can read more about Mandalas here. 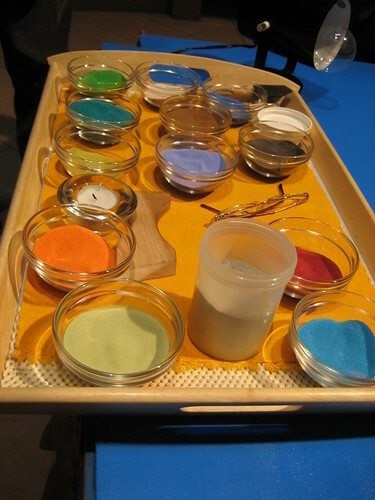 Creating a Mandala is a painstaking process and takes a very steady hand. Losang Samten uses two metal cone-shaped tubes which have ridges on the outside. When he rubs the tubes together the sand comes out in a very controlled manner. This particular Mandala is called The Wheel of Deluded Existence or The Wheel of Life. It is being created at the Philadelphia Cathedral from Sunday, January 13 to Sunday, January 27th. It will be on display until 12pm on Sunday, February 3rd, at which time the Mandala will be systematically destroyed and returned to nature as an acknowledgement of transience and impermanence. 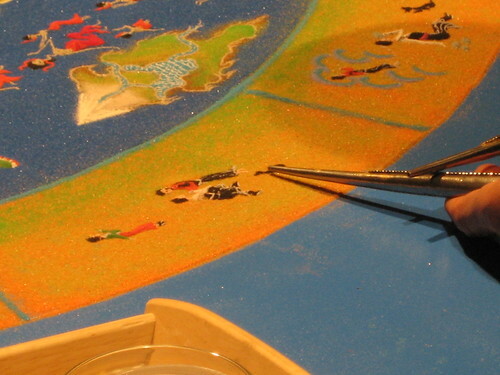 There is a webcam so you can see the systematic creation of the Mandala. You can see more photos on my Flickr set or on my friend Shana’s Flickr set. You can also read Shana’s post on our visit at her blog. You can find out more about Losang Samten through his website and through the Tibetan Buddhist Center of Philadelphia. Is there a way to have a photo for meditating . the wheel of life he is creating is so beautiful. please let me know. you should publish more about this subject, it may not be a taboo matter but generally folks don’t talk about such subjects.